The history of all musical instruments begins with the very young, as has been demonstrated through a variety of recent studies concerning the behavior and development of children. Unlike adults, children “play.” This is where they explore and develop their life skills, including verbal, vocal, communication and language skills. Children have many times the ability of adults to assimilate, manipulate, and create whole new vocabularies and languages. Recent studies into the history, taxonomy and origin of language itself, point to children as the original creators and developers of language. Children instinctively test the limits of their own physical capabilities and explore their immediate surroundings and environment in ways that adults do not. They climb, run, wrestle, throw, picks things up, poke and pry at them, stick them in their mouths, bite them, pull them, drag them around, pluck them, blow through them, hit them . . . it was inevitable that one day, some child wandering away from a group of women gathering food, idly picked up a blade of grass, stretched and held the grass it between its thumbs, blew on it experimentally, and created the first reed-like instrument. Another child found a precious toy laying to one side of a trail. It was the hollow casting of the horn of some animal. The child, being a child, put the small end of the horn to its lips and did something no adult would ever have thought of doing. Another child belonging to our primeval past discovered the curious resonance of striking a hollow piece of wood. Another discovered the pleasing sound of drumming upon a skin that had been stretched over a wooden hoop, a primitive instrument that exists even today amongst the Inuit and the Celts (the bodhrán). Children grow up and the games of youth are set aside, but not before the things a generation of children have learned are passed along to the next. Adults, who were once children themselves (it is hoped), though slow to change, eventually and inadvertently learn that the toys of youth have deep implications and uses in adult life; for rituals, because to the primitive the things of youth must have seemed like they belonged to some ancient collective memory; for defense, for the hunt, for warfare, for communication over long distances; and lastly, for social rites in the days before secular entertainment. Like the simple wooden flute, the bull’s horn has been with us for a very long time. We know from ancient accounts that the horn was used to communicate over long distances, but how far a distance? In the aeons before the sort of background noise pollution we have all become accustomed to, the sound of a horn could be heard for miles. As well, sound carries over water- so well, in fact, that on a calm evening, while on the water, normal conversation may carry up to half a mile. And the reflective properties of hillsides and mountains can sometimes carry the sound of a horn a good ten miles and more! How was a bull’s horn used in hunting? There were two ways. No one is certain which of these characteristics came first but the bull’s horn was used by hunters to pass on needed information in the conducting of the hunt. As well, the bull horn was used to summon game. A person adept at such skills can imitate a wide variety of game animals. Also, the bull’s horn generates low-frequency sound of a type that carries well. By the time mankind learned to work and alloy such soft metals as copper, zinc, lead, tin, gold and silver (the Bronze Age), horns were first decorated and adorned by these metals, and eventually were fashioned completely from them. These instruments originally came in the form of a straight trumpet, the oldest surviving examples of which were found in the tomb of the Egyptian king Tutankhamun in 1922, and which date from circa 1352 BCE. By the time it became possible to bend metal tubing, three general shapes became known: the circular “horn” design, the “trumpet” design, and the “bugle” design. The horn design featured a funnel-type mouthpiece, circular configuration, conical bore and mellow, pleasing tone. The trumpet design featured a cup mouthpiece, forward-facing configuration, cylindrical bore, and strident, blaring tone. The bugle design featured a deep cup mouthpiece, forward-facing configuration, conical bore, a more mellow and pleasing tone than the trumpet, and easier playing of slurring, tonguing and intervals. The earliest known mouthpiece was the smooth, round opening at the small end of the horn itself. As these and other primitive horns became better made and more ornate, they were fitted with mouthpieces fashioned from wood, bone, ivory, and later on, copper, tin, pewter, silver, gold, brass and bronze. Ivory and ox-horn mouthpieces dominated for a time, adorning a good many lip-vibrated aerophones, including the church and military serpent. A conical bore is a bore in which the tubing is tapered from mouthpiece shank to bell. A cylindrical bore is a bore in which the sides of the tubing, excepting in the bell and lead pipe, are parallel to each other. What Were These Early Horns Used For? 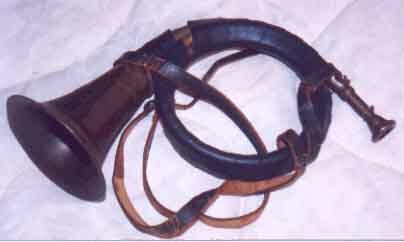 The metal horn was used for hunting and battle, though over time became primarily associated with hunting. The bugle was primarily a military instrument because of its dexterity, its small, easy-to-carry size, and the way the sound carried through the riot and mayhem of battle. The trumpet saw wide use as an instrument of heraldry, marking announcements, the arrival of dignitaries, and punctuating the pomp and bombast of the royal court. Horns of all types have also been widely used in various religious capacities since the dawn of recorded time, especially by the Semitic and Arabic peoples. The religious connotation of horns in the European tradition was still prevalent in the 19th century, as is evidenced by remarks made by classical composers such as Gluck and Berlioz. By the late 18th century, though inventions were many and competition was fierce between inventors and the patent offices they dealt with, the lowly bugle had long ago been overtaken by every other instrument. The natural trumpet, which was so long that the partials in the playing range were close together, could play fairly complete scales. The natural horn, by means of skilful manipulation of the hand inside the bell, was also able to play a complete chromatic scale. The bugle, however, was still primarily little better than an army signaling device, music-wise. But in 1810, in Dublin, Ireland, the bugle-maker and inventor Joseph Halliday placed keys on the bugle family of instruments, and produced the first keyed bugles, the bass version which came later being called the ophicleide. 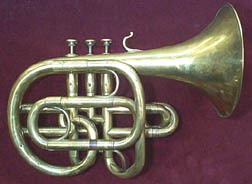 Halliday named his keyed bugle the “Kent horn” or “Royal Kent” bugle, after his military commander, the Duke of Kent. Suddenly, here was a bugle that could play the entire chromatic scale. It became especially popular following the Battle of Waterloo in 1815, when the British public heard and saw this instrument for the first time during the subsequent celebrating. Because of its small and practical size, military bands adopted this instrument soon after, leading to an entirely new and revolutionary musical ensemble- the all-brass military band. Five years after the invention of the keyed bugle came another revolutionary invention. Two inventors, Blühmel and Stoezel, added valves to a horn, the design of which was patented in 1818. A few years later, in Prussia, inventor Wilhelm Wieprecht invented his “Berlin pistons,” the piston design similar to the one we know today. Wieprecht went on to design an instrument whose mighty bass sound was much in demand long before its actual invention- the tuba. There is some evidence that a fully-formed cornet à pistons may have existed as early as 1825, as Périnet mentions on a patent sketch that a third valve was added to his 2-valve cornet à pistons, but no instrument or other documentation survives to verify this information. As well, the 2-valve cornet à pistons had been around a few years, but as playing a chromatic scale was only possible if one hand-stopped the bell, it is apparent that the 2-valve instrument represents a taxonomic missing link. At first glance the cornopean looks pretty much like the modern cornet. The main difference is that the valves, rather than residing in the middle between lead pipe and bell (as is the case with the modern version), are on the far left. Also, looking down upon the tops of the valves, one can see that the middle valve is offset to accommodate the lengths of one’s middle three fingers. This is because the cornopean was played in splay-fingered fashion, because one had to literally stretch one’s fingers over the tubing in order to reach the valves. At this point I would mention that although Adolphe Sax steps into the picture, he neither invented the circular cornet, nor did he invent the “over-the-shoulder” design employed by his Saxhorns. That distinction goes to Allan Dodworth, who patented the “over-the-shoulder” design in 1838. In the early 1840's Adolphe Sax arrived on the scene with his family of valved bugles, or Saxhorns as they became known. They ranged from an E flat soprano to an E flat bass. This entire family of brasswinds is important to us, primarily because they constitute the makeup of the traditional British brass band, but as this piece deals with the cornets, only the top two voices will be mentioned here. In his early days, Sax manufactured keyed bugles and cornopeans (and a variety of woodwinds as well). When it came time to create his Saxhorn family of valved bugles, he selected three designs- helical, upright and over-the-shoulder- for the top two voices of his new brasswinds, the E flat soprano and B flat Saxhorns. The latter instrument was sometimes referred to as the alto in British nomenclature. The helical design with its bell upraised at approximately a 45 degree angle, in particular, was very popular during the American Civil War, and in Europe until circa 1900, right alongside the valved Posthorn-style circular cornet. All the other Saxhorns came in upright and over-the-shoulder form. The modern cornet as we know it today, with the valve casing in the middle between the lead pipe and bell tubing, and with Shepherd’s crook at the beginning of the bell tubing, was first manufactured by Antoine Courtois in 1855, and was called the modèle anglais. Prior to the development of the modern cornet there was the E flat soprano and B flat alto Saxhorn, which were used as the highest sounding voices in UK and US brass band music until their demise shortly after the US Civil War. Most modern versions I’ve tried have a modern cornet bore profile, and resemble the original instruments only in shape, but the originals and faithful replicas I’ve tried have the trademark Saxhorn idiosyncrasy, the out of tune fifth partial, which might help to explain the demise of these particular instruments, in light of the near-flawless intonation of the modern trumpet and cornet. In the US, these instruments were known primarily as round, circular or helical cornets. In fact, I’ve found remarkably few references in the US to Saxhorns as such, except for the over-the-shoulder design and some of the old-fashioned upright lower brasses like the tenor horn and baritone, prior to their having been redesigned to shorten their height. The subsequent incarnation of these instruments are rarely referred to as Saxhorns. Though the trumpet is an instrument in its own right with its own history, it is impossible, when writing a piece on the cornet, not to mention the trumpet, because of the borrowing of ideas during the development of keyed and valved brasswinds. More than ten years before Joseph Halliday made his first keyed bugle, the instrument-builder Anton Weidinger built a six-key trumpet upon which he performed Haydn’s famous trumpet concerto in Eb, though neither this instrument nor Haydn’s composition were a first. Weidinger’s keyed trumpet was based upon earlier instruments. Part of the proof lies in the fact that there are works for keyed chromatic trumpet that predate the Haydn concerto in Eb. Regardless, Weidinger was a keyed trumpet player well before 1800, the keyed trumpet is known to have existed in some form at least as early as 1750, and the progenitors before the addition of keys, trumpets having holes, date back to the Baroque era, so the underlying principle was certainly nothing new. Joseph Halliday’s success with his keyed bugle was mostly serendipitous. Knowing of the keyed trumpet, he merely cut holes in the sides of a bugle and added keys. In this sense, rather than being an inventor, he was rather the successful marketer of a timely idea. The demand for chromatic brass preceded the invention and supply, and at the time, demand was at an all-time high. That the rotary-valve trumpet was invented in 1835 by Joseph Riedl, and the piston-valve trumpet by François Périnet in 1839, is noteworthy, if only because these instruments predate the modern cornet whilst demonstrating the pre-existence of the needed technology to build the modern cornet. Though it is said of the modern Bb trumpet that it is a cylindrical-bore instrument whilst the Bb cornet is a conical-bore instrument, in truth, both the modern Bb trumpet and cornet are conical-bore instruments. In point of fact, they are both cornets: the modern Bb trumpet is not a trumpet. The proof of this was verified only very recently by Kenton Scott’s Horn-u-copia website. Until recently it was known that the Bb trumpet first appeared in the 1880's as a rotary-valve instrument in Europe, but the Perinet-valve variety was something of a mystery until the Horn-u-copia website was able to verify what many of us had long suspected- that the modern Bb Perinet-valve trumpet first appeared on the market circa 1910 as a cornet, not as a trumpet. The first instruments came with a cornet mouthpiece and were sold as “long-model cornets”. The real Bb trumpet, in fact, is and always has been the Eb contra-alto trumpet whose useable range is identical to the Bb cornet. The contra-altos in D, Eb and F have the same useable range as the A, Bb and C cornet. Separating the Bb cornet and trumpet in terms of category has always been problematic, if not because they are both cornets but because the cornet itself has drifted away from its original design. Certainly in circa 1910 there were cornets that were more cylindrical than the average Bb “trumpet”. Many of the instruments dating from this period had an “S” shaped configuration between the lead-pipe and valve-casing that necessarily consisted entirely of cylindrical tubing (because each bend included a slide) which accounted for a large proportion of the instrument’s overall length. In the final analysis it is the ear that must decide, and when both the modern Bb trumpet and cornet are performed side-by-side with the true Bb trumpet, the Eb contra-alto, one can clearly hear which is a true trumpet and which is not. For this reason the contra-alto in Eb and F is regaining popularity in the symphonic repertoire because the Bb variety cannot reproduce the martial qualities of the contra-alto. A family of instrument that gets too little attention these days is that referred to as the cornet, cornett, cornetti, zinck, and a variety of other names. These were lip-vibrated aerophones made of either horn or wood, and which were played either with or without a mouthpiece. In the latter case, the mouthpiece was carved right into the instrument. They deserve mention here because they bear the same name, they were a lip-vibrated aerophone, they had a conical bore, they had a cornet-like sound, and they played an important role in early Western music. Many find them devilishly hard to play, because the mouthpiece diameter is much smaller than that of the modern cornet/trumpet. These instruments could also play the chromatic scale, back in the 1400's! It has been said that the discipline of taxonomy is of limited use where the design of musical instruments is concerned. The reason given is that taxonomy refers primarily to organic processes that are linked by a genetic component. In other words, things cannot happen spontaneously in nature. Nature cannot be inspired to create a new and novel design. Everything progressive in nature is a series of adaptations contingent on the existing state of the organism in question. In the inorganic world, it has been argued, the builder is free to act upon whimsy, making leaps of intuition that are not in keeping with the workings of genes. The constituents of human thought, viz. language, can be analyzed taxonomically (The origin of language: tracing the evolution of the mother tongue, by Merritt Ruhlen, pub. by John Wiley & Sons, Inc., ISBN 0-471-58426-6). Furthermore, the uses to which language are put likewise are possessed of taxonomic properties. For this reason, all human thought moves along lines that are clearly and obviously evolutionary, and therefore taxonomic. And it is telling that our basic tool of reasoning, Logic, acts as an analogue for genetics in biological processes. The sum total of human knowledge follows lines of classic taxonomic structure, and evolves just as living organisms evolve, though through other means. To argue otherwise is to ignore the fact that Man cannot conceive of anything wholly outside his experience and the modus operandi of his own senses, any more than he can freely invent words at a whim. Even nonce words must be shared by mutually perceiving minds if they are to have any use beyond that of mere intellectual exercise. My reason for raising this matter is to caution the reader to exercise a healthy skepticism. If a book says so-and-so “invented something out of the blue” on such-and-such a date, do not take it on faith that this is so. In point of fact, more often than not such claims are pure baloney. Complex inventions like timepieces, scientific instruments and musical instruments are invariably fusions of disparate knowledges and types of manufacturing expertise, and which are often brought together for purposes entirely different than that of the original, often by a number of people working independently. The kind view is that these people are unaware of each other’s efforts. My view is that they knew very well, in view of the fact that they were competing fiercely with one another. That said, here is what I mean by pure baloney: Galileo did not invent the telescope, though if you watch television shows like Jeopardy, Galileo is invariably the answer to the question, “Who invented the telescope?”. The earliest known telescopes were made by Hans Lippershey in 1608. Bell did not invent the telephone. Nicola Tesla, Elisha Grey, and Antonio Meucci (who was perhaps the earliest) all beat him to it. Several of the historic explorers were frauds. The Wright Bros weren’t the first to fly. Sax did not invent the saxophone. 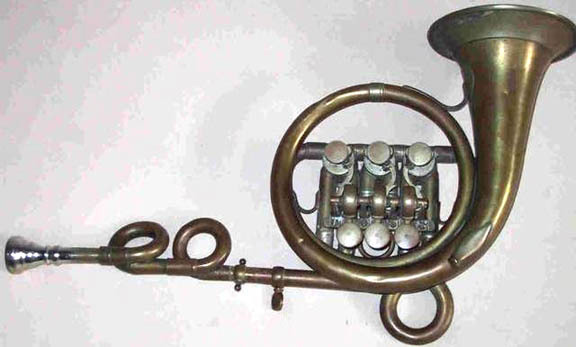 Halliday appropriated the design of the keyed trumpet in order to make his keyed bugle, and Henry Distin intentionally ripped off the design of Herman Koenig’s horn when he built his first Ballad Horn. The list is endless. What is safe and proper is to remove the words “invented” and “(the date given)” in your mind, and to substitute the knowledge that certain components became available around a certain time and were put together to make a particular instrument, and here is an example from that time, made by so-and-so. For example, keys such as those used on the keyed trumpet and bugle were used on woodwinds a long time before. The ability to fashion a tube or cone of metal and bend it into a circle or trumpet- or bugle-like shape also predates either instrument by a very long time. In point of fact, “invented” is far too strong a word. The parts were available long before the actual instruments got made. What was missing was a catalyst that would bring those particular attributes together. That catalyst was the growing complexity and demands of the music of the time, plus the growing size of the symphony orchestra and its attendant expanding audience, and the creation of the brass band which usually played outdoors. In other words, the demand preceded the so-called “invention.” That’s not “inventing” in the true sense. It is the unconscious employment of the underlying principals of taxonomy (if not those of socio-economics), for which Mankind seems to think he has the right to take credit. Silly humans. Taking credit for inventing the inclined plane, usually in places with lots of hills and valleys and mountains. No wonder we once wanted to believe the Earth was flat . . .